L is or the way you Look at me. 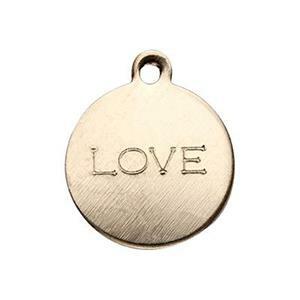 And you’ll Love the Looks you get with our GF2211 – 14/20 Yellow Gold-Filled Circle, LOVE Word Charm. For the Very, Very Extraordinary Look your Jewelry Designs will make! These have a .8mm Inner Diameter Hole which will accommodate a 21 Gauge or Thinner Jump Ring. LOVE can easily be made for Me and You with one of our Gold-Filled Footage Chains.